K2-3 is a nearby M-dwarf star at 45 parsecs (150 light years) from Earth. It has been observed with the Kepler spacecraft in the K2 configuration. The accurate photometry of the NASA satellite allowed the discovery of three small transiting planets, with radii between 1,7 and 2 R⊕. Furthermore, the outermost orbit is close to the inner edge of the stellar habitable zone. 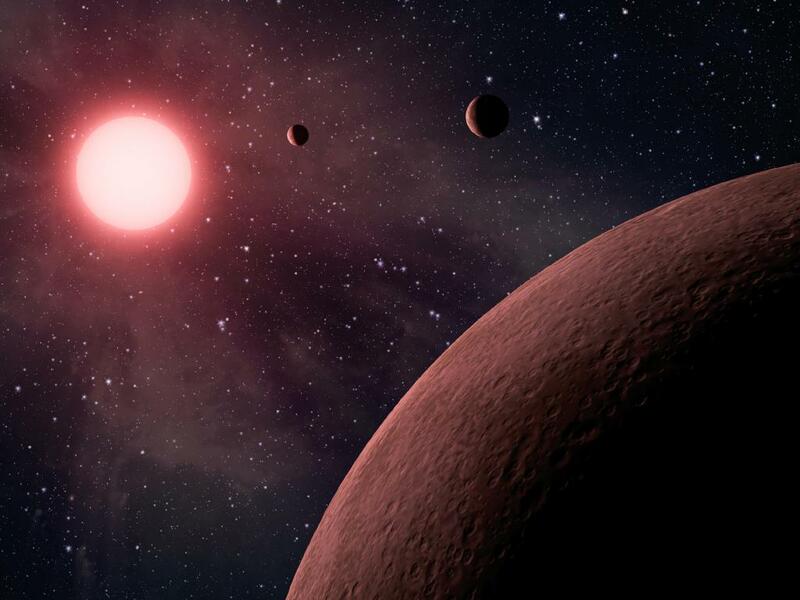 A team led by astronomers from INAF (Istituto Nazionale di Astrofisica) presented a new study aimed at determining accurate masses for the three planets. More than 300 radial velocity measurements were collected over 2.5 years with the high-resolution spectrographs HARPS-N installed at the Telescopio Nazionale Galileo (La Palma, Canary Islands) and HARPS installed at the ESO La Silla 3.6 m-telescope. T he use of such a large dataset was joined to a proper treatment of the stellar activity signal. Indeed, the stellar activity component was the strongest signal present in the radial velocity time series of the star. 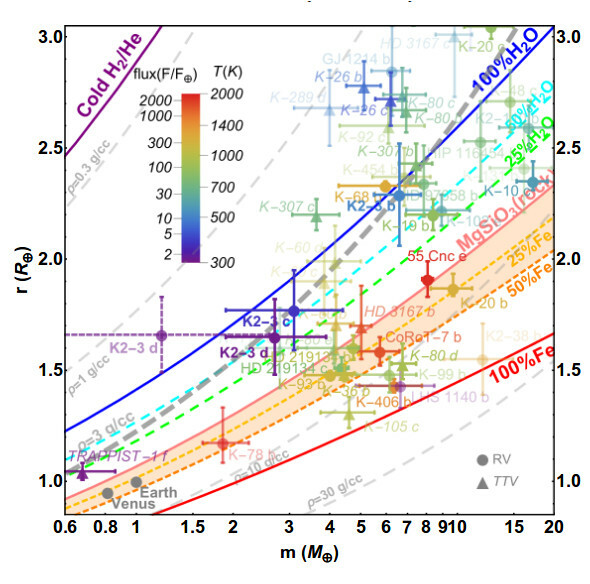 "Our goal was to measure the mass - and therefore the density, since K2 photometry provided us the radius - of the three planets, to accurately characterize the planetary system by defining the average composition of each planet" says Mario Damasso, researcher of the INAF-Osservatorio Astronomico di Torino, coordinator of the study on K2-3. "However, despite hundreds of measurements and the combined efforts of several teams, the mass of the outermost planet remained unmeasured. Our analyses show that the main obstacle to the identification of this planet should be the high level of the stellar activity. Even knowing that the planet exists and precisely the parameters defining its orbit, our data do not show the expected signal". An intriguing possibility is that the orbital period of K2-3d is close to (and then indistinguishable from) the stellar rotation period. Astronomers only could give a very approximate estimate for the mass of this third planet: Md ~ 2.7 M⊕. On the other hand, they could derive masses for the inner planets, K2-3b (Mb = 6.6 ± 1.1 M⊕) and K2-3c Mc = 3.1±1.3 M⊕ in a reliable way. These mass measurements imply that the density and the interior structures of the three planets may be similar, with small H, He e nvelopes (< 1%) or massive water layers (with a water content > 50% of their total mass) on top of rocky cores. But it is not only the stellar activity that makes hard the study of these small planets. As Ennio Poretti, Director of the Telescopio Nazionale Galileo points out, "their weak signals can easily be confused with the effects of sampling the measurements performed by a single site. It is strategic to keep very precise instruments available to the scientific community at different longitudes in order to have a more continuous time coverage. In this context, the TNG remains an indispensable structure". Mass-radius diagram for exoplanets for which the mass and radius have been both measured with a relative error better than 30%. The location of the K2-3 planets is emphasized. The planetary data are taken from the NASA exoplanet archive and updated to 30th August 2017. Artist's view of the K2-3 system. Credits NASA/JPL-Caltech.